When it comes to chainsaws, there is a large assortment to choose from, all with different kinds of power sources. The three main power sources include two different kinds of gas, as well as electric. Although gas will allow you to be more portable, you also have to deal power outages more often. When it comes to having a chainsaw which will always have power, going with an electric power source is the best choice. Once you have decided that you want an electric chainsaw, you need to figure out the next﻿ features you would like to have on your chainsaw, as there is a large assortment of options to choose from. Within this article, we’ll give you a comparison chart of different electric chainsaws on the market. We’ll then help you decide which characteristics are available so you can decide which ones are most important to you. Lastly, we’ll provide you with some reviews of some of the hi﻿﻿ghest rated electric chainsaws in the market today. Here is a comparison of certain features of the four electric chainsaws we will be reviewing later on within this article. What Characteristics Make A Great Electric Chainsaw? 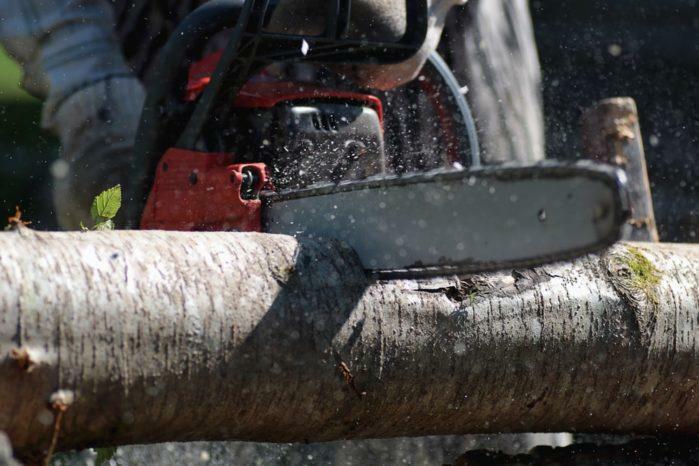 When it comes to chainsaws, there are a few different attributes you can consider to find the right one for you and your needs. The first aspect to consider is the length of the bar. The bar of the chainsaw is the part which sticks out from the chainsaw that the chain runs on. The shorter the bar, the easier the chainsaw is to operate; however, it also means that it can only cut shorter branches. If you have small bushes or trees, then going with a shorter bar is a good idea, as it allows you to do trim work easier. In contrast, if you have larger stumps of wood or bigger branches you are dealing with, then you will want a bar which is longer is size. Just remember, the longer the bar, the heavier the chainsaw will be and the harder it becomes to control. With the bar, not only do you need to think thru how long of a bar you need, but you should also take into account the type of bar you will have. There are three main types of bars with chainsaws – a Solid bar, a Laminated bar and a Safety bar. The Solid bar is typically comprised of solid steel, which means it is heavier than most, and is used most commonly within commercial jobs. It is very durable, and the noses of the bar can be exchanged out as the steel tends to dull faster. A Laminated bar has a mixture of material in them, which means the bar is lighter and is easier to handle. However, the noses on the bar are not as interchangeable because the bar itself can’t handle the weight as much. A Safety bar are designed to have nose which is smaller, meaning there will be less kickback with each stroke of the bar. These are found on smaller bars, and means that you will not have the ability to cut larger branches. Along the bar, you have a chain which does the actual cutting. The chain is made out of a steel rivets, and the cutting edge is alternated between left and right side of the rivet in order to give you as much of an even cut as possible. The chain will come in a wide variety of gauges and pitches. The gauge is the thickness of rivet, whereas the pitch is the length of three consecutive chain links divided in half. The thicker the gauge, the less the vibration is of the chainsaw. The pitch is needed to ensure that your chain cuts evenly, so you can have a clean and smooth and efficient cut. If the pitch is off, then you will have a slower cut with your chainsaw, which will just add time to your project. Another feature to consider is how the chainsaw deals with oil. Even though it is electric, the chainsaw still needs oil for the chain and the bar. There are some models which do not give you any indication, there are some which give you a window you can look into, and others have the capability of lubricating the bar automatically. 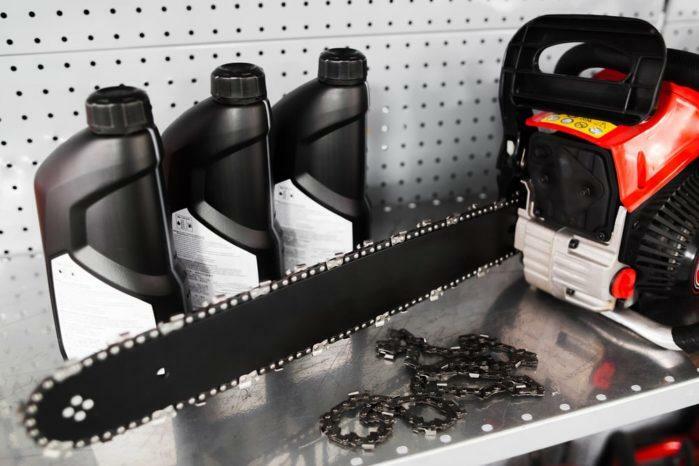 Depending upon how often you will be using your chainsaw, and for how long of a stretch it is used during each use, should help you refine the type of oil system you want on your electric chainsaw. There are also some safety features to take into consideration with your electric chainsaw. One of the most important is the rear handle guard. The handle will protect your hand in case there is anything which goes awry with the chain while it is in operation. Having a rear handle is a necessary feature to have to ensure your hands and arms stay safe while the chainsaw is in operation. There is also a chain breaker and a chain catcher to take into consideration. The chain breaker take effect when there is a major kick-back, meaning the chain will stop rotating so that it cannot damage anything until you have the chance to get the chainsaw back under control. The chain catcher is a hook within the housing unit which will catch the chain if it ever comes off the bar. This way, you do not have a chain which goes flying off the bar in case it ever comes off by the bar by accident. When it comes to features, there is a large variety to think about and to choose from. Make sure you find the ones which best meet your project needs. Here are four of the highest rated electric chainsaws in the marketplace today. Equipped with a chain system which comes with an auto-tension capability, you can be confident that this chainsaw will perform at a high level for a long time. By having the correct amount of tension on the line at all times, you are ensuring you don’t have too much or too little, which will also help the chain to have a longer life. The oil level within the electric chainsaw has an indicator light to let you know when it is low. In addition to this, there is an automatic oil lubrication system within this chainsaw, so you don’t have to stop what you are doing when the light comes on. This chainsaw comes standard with a powerful 14.5 Amp motor, which will allow you to have the power that a gas chainsaw provides, yet have the constant power source an electric chainsaw can bring you. This electric chainsaw option from Black and Decker comes with an 18” blade, along with a powerful 15 Amp motor. The chainsaw comes with a low-kickback bar, which will help protect you anytime there is any kickback while cutting thru wood. You can easily change the tension within the bar without having to drag out any tools, which will allow you to change the tension as needed while cutting thru various types of wood. For safety purposes, this electric chainsaw has a chain break feature, as well as an oil system which will automatically lubricate the chainsaw as needed. The base is made from an ergonomic design thought process, meaning your hands should be comfortable while holding the chainsaw at all times. The tension adjustment for the chain is very easy to make, and does not require a tool of any kind to perform. The motor has a sensor on it which allows it to tell when it might start to be overloading; the sensor will reduce power automatically to ensure the motor does not burn out. The oil level can be easily viewed thru the provided window, and the oil tank is quite large, ensuring you do not need to replace it as often compared to other models. Once you pull the Red lever, once the chain moves from the nose to the base, it will be sharpened with each rotation. This feature will ensure your teeth stay as sharp as they can to cut thru any material. This chainsaw has a powerful 15 Amp motor, giving you the necessary power no matter what your project is. The bar on this chainsaw is 18” long, meaning you can cut thru any size branch or tree. This chainsaw has a lower vibration in comparison to others within the market, and has a chain break in order for you to stay safe while it is in use. If you’re looking for something that can help you do small cutting jobs around your backyard, then this is a good option for you. The Remington RM1425 is perfect for the suburban owner who’s looking to trim and remove unruly branches from their prized trees. It’s easy to use and handle, very light and quiet, which makes it the perfect tool for those living in a quiet street. However, it’s not very powerful so it won’t be able to do any heavy duty jobs. This chainsaw doesn’t have a vibration reduction function and it takes to take longer cutting through wood than other models so it can be very tiring to use. Easy to care for, as it only needs occasional sharpening. When it comes to choosing the right electric chainsaw for your project, there are certain features which should be more appealing to you than others. Once you think thru what kind of project(s) you will be working on, you should be able to eliminate a large assortment of the options within the marketplace, and then you just have to find one that fits within your budget. Having this tool in your arsenal is a great tool to have to help you clean up your yard and allow you to cut some dead weight off of some trees and branches.We wish you nothing but luck and success as you find the right electric chainsaw for your needs!